Taingang daga” does not belong to the rats, although it resembles rat’s ear. “Taingang daga” refers to the edible high-protein tropical mushroom. It is a highly nutritious food, being an excellent source of riboflavin and niacin. The protein content is about 16-25% which is comparable to some protein-rich legumes. Taingang daga is expensive too! Thus with the money-making potentials of Taingang daga plus its high nutritive value, why not go into business and make profits out of mushroom growing? A saprophytic fungus, growing in tree stumps in damp moist forests. Plant is formed by multi-celled hyphae extracting nutrients from decaying tree trunis or logged timber. Spores extending from the tree trunk are shaped like human ear, of variable sizes, smooth, dull brown to gray,sticky when moist, leathery when dry. 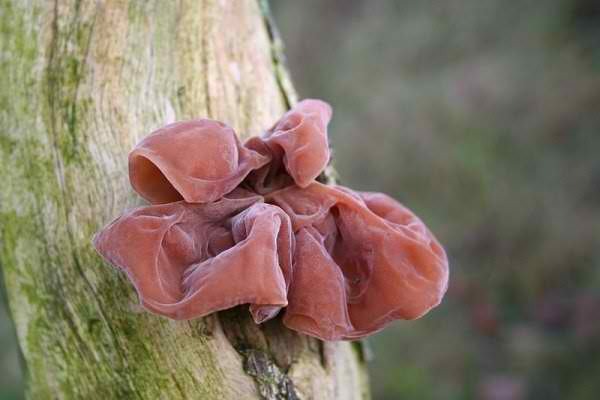 Auricularia is found throughout the Philippines in damp moist forests. Other than the auricula-judae species, another species reported edible is Auricularia affinis Leville. It’s neutral, and pleasant tasting. Used for metrorrhagia, urinary tract diseases, dysentery. Culinary: Imported in dry state from China and Japan. A popular ingredient for chop-suey, sotanghon, pinsic, etc. The Tropical Mushroom Research Laboratory (TMRL), National Institute of Science and Technology (NIST) at the NSDB science complex, Bicutan , Taguig has successfully demonstrated the growing of this tropical mushroom species, scientifically known as Auricularia. The new method is growing it on sawdust – from composting, seeding of spawn to planting in a growing house. The NIST project assists and extends technical training to those interested in mushroom cultivation. It continues research and development and the cultivation of the edible fungi, all geared towards the establishment of the mushroom industry in the country. The Biofoods, Corp. in Tagaytay, can be considered a leading big-scale producer of taingang daga with daily production of 500 kilos. Taingang daga grows in various media such as wood, coconut trunks and bamboos under low temperature and high moisture. The growing of Auricularia has been for a long time been done in bed logs. But since the objective is to maximize profit in mushroom production, sawdust, a waste material in the lumber industry was found a suitable growing medium for taingang daga. Select white ordinary-sized sawdust from the lumber yard, and dry for two days under the sun, or until the moisture content is reduced to 15-18%. Weight separately 78 kg sawdust; 20 kg of fine rice bran; 1 kg of refined sugar and 1 kg of calcium carbonate. Mix thoroughly. Increase the moisture content to 65-75% by slowly adding water with the use of chemical sprayer. When a handful of the mixture is pressed in the hand and no water runs-off in-between the fingers, but will stay in form after releasing the pressure, the moisture content is approximately 65-75%. Pile a pyramid shape, cover with plastic sheet and ferment for 5 days with one turning of the pile on the 3rd day. Sieve through 1.5 mm mesh to remove bigger particles, as well as to break the lumps which were formed during the fermentation stage. Pack tightly 1 kg of fermented substrate in every 1-liter capacity bottle. Make 1.5 cm diameter hole by thrusting wooden sticks down to 2 cm from the bottom. Plug with cotton and cover the mouth of the bottle with water-resistant paper, held in place with rubber band. Sterilized for 1.5 hours at 20 psi or steam at 100°C for 10 hours. Cool at room temperature (28°-30°C) and inoculate with a pure culture of Auricularia. Incubate at 25-28°C for one month or until te whole substrate is covered with mycelial growth. Discard contaminated (spoiled) bottles. Pure cultures of Auricularia may be obtained at DOST (see contact details below). Break the bottle, get solid spawn and brush off glass splinters before placing in the growing house. Place the spawns side by side 10 cm apart on top of wooden slatch. Three wooden shelves with slatch flooring measuring 90 cm wide and 11 m long, are constructed at the middle, and along the sides of the growing house. Each layer can accommodate 4 rows at 55/row or 220/layer. Each shelf with 4 layers could provide enough space for 880 spawns. Three shelves can accommodate a total of 2,640 spawns. Maintain a high relative humidity (RH) of 75-90% by aerial spraying with superfine moist nozzle sprayer at least twice a day. Harvest mature sporophores in 12-14 days after placing the growing house. If soiled, wash gently in slow flowing water, drain and spread thinly over winnowing pans (bilao) and dry under the sun. For every 1 kg of growing substrate, an equal quantity of taingang daga (fresh) can be harvested. For every 10 kg of fresh tengang daga, 1 kilo of dried product can be recovered. Put the dried Auricularia in thicker plastic bags and seal or tie tightly to prevent accumulation of excess moisture. Air tight containers can also be used in storing product. The growing house is basically an A-type. It measures 5 m wide, 12 m long and 4 m high. Roof is made of cogon or nipa thatches or low-cost hollow blocks. The growing house is completely lined inside with plastic sheets (gauge no. 8). Below the dome-shaped plastic ceiling is 45 cm square ventilators with fine wire mesh screen 1 m apart are provided above the back door. Your welcome sir... ang tengang daga po ay very abundant sa pilipinas.. pero pwede din po siya i cultivate. hello sir san po pwede bumili ng spawnfor this type of mushroom? the technology should be more accessible in rural areas to help create jobs and industry. A saprophytic growth, developing in tree stumps in clammy wet woodlands. Plant is shaped by multi-celled hyphae extricating supplements from rotting tree trunis or logged timber. Spores stretching out from the tree trunk are formed like human ear, of variable sizes, smooth, dull chestnut to gray,sticky when damp, rugged when dry. All the gardens reach a point where they need a little renovation. Renovation is a huge work. It requires a lot of new ideas, time, and knowledge. Most of the people want to rearrange their garden to be more beautiful and more comfortable. Some people want to install a pond or a swimming pool. Learn the basic steps and concepts of Japanese Gardening. This article contains useful information on how to give any common garden a Japanese atmosphere with harmonious results. What is the actual use from those mushrooms. I meant to say, what are the possible ways to use them on a regular basis? They are delicious saute'd with salt & pepper, I had some tonight for tea, they are packed with vitamins, I can understand that not everyone would find them as yummy as I do, but they are supposed to be a delicacy. Do have a video on how to grow this type of mushroom sir?